"It's never just a movie." 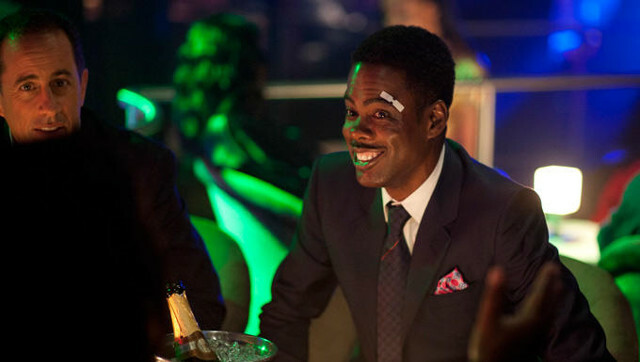 Top Five is easily comedian Chris Rock's first successful cinematic vehicle as a filmmaker. As both the writer and director, he's mostly able to get across his energetic brand of comedy and highbrow artistic sensibilities. He balances thoughtful, broad comedy and African-American experiences while channelling Woody Allen's version of New York with his own. It's most watchable when it uses famous faces (none funnier than J.B. Smoove) and every New York based black comedian to satirize the Hollywood lifestyle. It's too bad what eventually sinks the film's comic momentum and satire is the formulaic romantic comedy elements with Rosario Dawson's character. While she gives a strong, likeable performance, clearly being in her home element walking and talking on the streets, her offbeat reporter character following Rock (playing a version himself) under the guise of a big newspaper profile devolves into a repudiation of entertainment journalism and artistic criticism. Little details of the characters in the film conveniently come back later to set off artificial comic situations and plot contrivances to get the overly conventional and gimmicky plotting along. The two almost seem mismatched from different films. Big ideas and themes of addiction, marriage, friendship, race, and growing up are compacted into the tight 100-minute running time and limited all-in-one-day timeframe walking around the city. While sharp and feeling big and Hollywood with numerous cameos and sequences riffing on blockbuster movies and reality shows, Top Five remains fully grounded in Rock's more independent feel as a filmmaker (think I Think I Love My Wife, Down to Earth, and 2 Days in New York). Rock has crafted a mostly winning film about his life as a comedian while being black and famous. Top Five comes close to replicating his trademark firebrand of standup comedy. By using his own personality and fictionalizing his real-life experiences as a seasoned comedian, Rock really gets across his identity as an artist by building a funny and interesting narrative of his entire career.